Alabelī. Dhāmī, Mohanalāla Cunīlāla. Rājakoṭa, . From the University of Chicago Library. અલબેલી Albeli, મોહનલાલ ચુનીલાલ ધામી Mohanlal Chunilal Dhami, 1962. 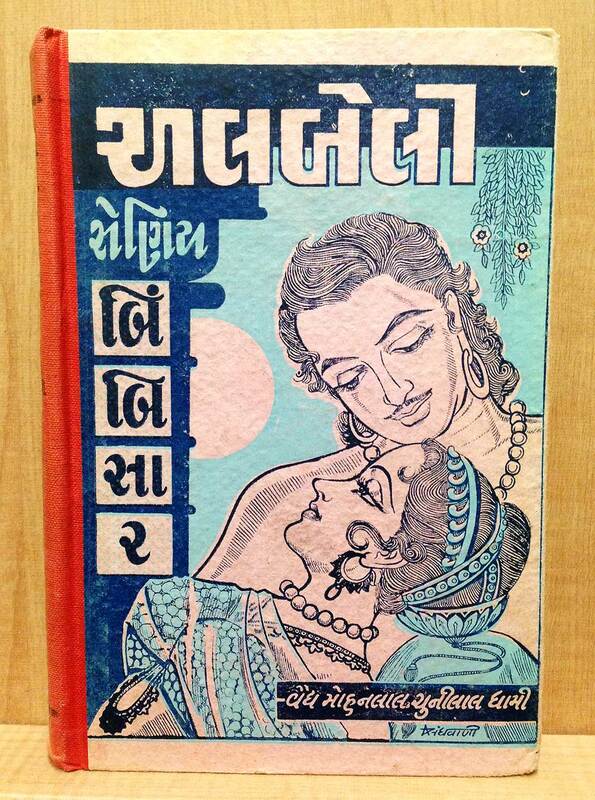 The other text on the side is સેણિય બિંબિસાર, Seniya Bimbisara. According to my very quick wikipedia skimming, Bimbisara (also known as Seniya in Jain histories) was an ancient king of the Magadha empire (located in the southern Bihar region), and was a disciple of Buddha. The book’s information page says it’s part of a series called “Magadha granthāvali” – Does that mean that this book is just one book in a giant series about the Magadha empire? I am not sure what Abeli means – I couldn’t find a translation. Is that the woman’s name? Was she one of his wives? I have so many questions!